I'd like to share this awesome video from Maron, in it you can see YJ very preoccupied with his passion for photography. Click here to enjoy the movie. 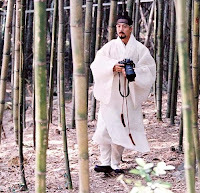 Dear Maron, thank you so very much for making such an awesome video of Yong Joon ssi ! I heard about the big earthquake in Indonesia. Hope you and your family/friends are OK. Thank you so much for your concern and prayers, I am so touched. Yes, it was rather big, but far from us here [I'm in Java Island] so we did not feel it, it was in Sulawesi Island.. Hoping all's well with you and Pallet too. I'm glad you are ok. I like this post Myoce, I never saw him with his cameras in the past like this one and he's absolutely passionate about it. If not for who he is, you would mistaken him as one of the crew. I think the photobook would be a living proof of his passion in photography. Thank you. p.s smt's wrong with all the files I converted,windows won't let me open them again coz of a virus threat. I ran the VGA prog through the file but it came out clean, any ideas? sobsob! Oh No Hyds, far,far from it..